Friday, June 21 2013, Washington will play host to an evening that evokes Old World royalty, fairy tales, and 18th century European charm. 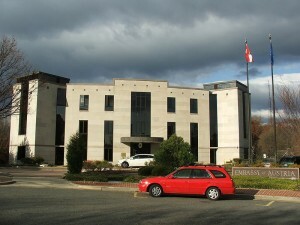 The Austrian embassy in Washington is opening its doors to bring together the glory of Old Austria with the allure of Modern Western Europe. From the music of Strauss and Mozart from a live symphony orchestra to a late-night European style DJ playing favorite hits, this Austrian Ball has something for everyone. This event is perfect for both couples and singles alike and the organisers expect a sell out audience of young professionals. Taking center stage for a 20 minute presentation, dressed in pure Viennese style, we’ll marvel at a fantastic waltz presentation set to the Blue Danube or the Emperor’s Waltz by Strauss. Local Ballroom Dance Masters (Carol Traxler and David Norton) will be on hand at the ball. They will lead you in the Grand March to the famous Radetzky March of Johann Strauss Sr. David and his partner will demonstrate a beautiful Viennese waltz. Carol Traxler will teach you the Fledermaus Quadrille (danced to traditional Viennese music by Johann Strauss Jr.) to emulate the Fledermaus Quadrille danced at the balls in Vienna. In the latter part of the evening, we will visit the greatest Austrian nightclubs as Washington, D.C.’s greatest D.J.s deliver us the best in retro, swing, salsa and top 40 dancing – European style! The evening will also feature a buff of Austrian food, beer and wine. To get the full details and register, visit www.thingstodoDC.com.